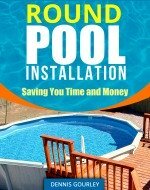 I have a 27foot round above ground pool and have small leaks coming from the skimmer basket. I have the double sided gasket sandwiching the steel wall so there is a gasket on the inside and outside of steel wall. I then have the liner on the inside and then the plastic piece that screws to the basket using approx 14 screws. I have this very tight, but still have some small leaks on the outside of the steel wall. I don't want to over tighten. I notice I have a second 2 sided gasket. Do I use this in the inside against the liner and the hard plastic piece? I was also considering taking each screw out and adding some marine grade silicone before they go back in. Hi Carl. This page explains the process I go through for leaky skimmers. Following these suggestions will probably fix your problem. You don't want to add another gasket to the inside, this would only make it worse. Most of the time the gasket is just slightly out of alignment, usually on the outside of the pool. You need to be able to see the same amount of gasket all the way around the skimmer. Most of the time, for me anyway, there is a small amount of gasket not showing underneath the skimmer. When I loosen all the screws and adjust the gasket so it shows under the skimmer the problem is solved. Other times its just a matter of more tightening on the screws. It takes a lot to over tighten them so don't hesitate to give them all another turn. I cannot get my flex hose connection to the bottom of the skimmer to quit leaking. I have put 2 hose clamps on and have tightened them as tight as I can, still the water flows up and down the flex tube. Any suggestions. Hi Mike. 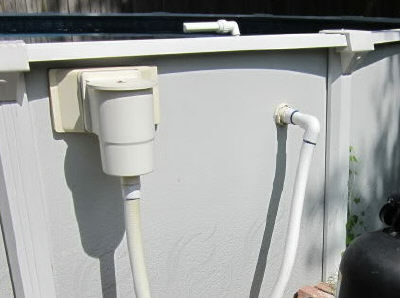 Here are all my tricks for leaky hoses on above ground pools. You have used the double clamp one, that usually works. You could try dipping the end of the hose in very hot water for a minute and then putting it back on. Another trick I have used is to wrap Teflon tape around the fitting and then putting the hose back on. Sometimes the insides of the hoses have small burs that can be removed with a razor blade to make them smooth. Most of the time when I have a leaky hose I simply loosen the clamp, twist the hose and tighten the clamp back up. This usually works. You may just have a hose that is two big for the fitting and replacing it with a different brand would be the solution. On my service trips I have several different hoses with me and sometimes I may try a few to get one to not leak. If all else fails you could always plumb the pool with PVC pipe. This is a nice setup done with flexible PVC pipe. I much prefer this over solid pipe and it is so much easier.